Recently Warda designer collection has launched their Ready to wear Eid collection 2012.This stunning ready to wear Eid collection is of course consisting on stitched dresses with very beautiful designs and patterns . Warda Fashion Brand was came upon in 2006 and famous for bounty Fabrics at economical prices with best stitched designs granting the latest fashion trends. They are having more than 30 branches in Pakistan and peculiarity in ladies loose and sewed fabrics. 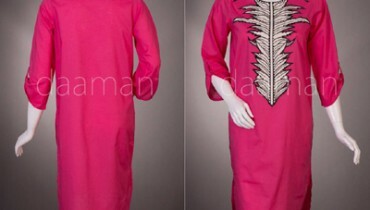 They deal with Premium voile, cotton Lawn, chiffon, wollen, cotton, khaddar and silk fabrics for women. This collection comprises of magnificent and stunning design and very attractive colors. The most beautiful thing in their stitched dresses is attractively designed chiffon sleeves which are giving a perfect unite with lawn stuff. This collection latest fashion trend of Salwar Kameez, stylish frocks, A-line shirts, long shirts and Bridal Frocks with Churidar Pajamaare included.